A man who attacked his MP with a Samurai sword has been convicted of attempted murder. 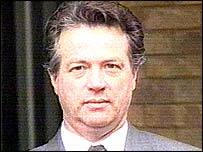 Robert Ashman, 52, had denied trying to kill the Liberal Democrat MP for Cheltenham, Nigel Jones, on 28 January 2000. Mr Jones's assistant, local councillor Andrew Pennington, died in the attack at the MP's weekly constituency surgery after being stabbed six times. Ashman had previously admitted the manslaughter of Mr Pennington on the grounds of diminished responsibility. On Thursday a jury of seven men and four women at Bristol Crown Court deliberated for less than six hours before finding Ashman guilty of the attempted murder of Mr Jones. Ashman was remanded back to Broadmoor Hospital for 12 weeks to allow psychiatric reports to be completed before sentencing. Mrs Justice Heather Hallett said: "I am very conscious as to public safety. "I must be allowed to allow doctors at Broadmoor the chance to look at him again. "The protection of the public will be utmost in my mind. I still feel that my duty is first and foremost to the public when one sees what Robert Ashman did." The jury, which returned a majority verdict of 10-1, heard Ashman had one previous conviction against a council worker he attacked in 1993. Earlier in the four-day hearing they had been told how Ashman, a regular visitor to Mr Jones's surgeries, had taken his father's sword with him on the day of the attack. After asking Mr Jones to look at a letter for him, he pulled out the three-foot long weapon and lunged at the MP with it. 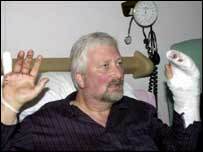 Mr Jones suffered serious injuries to his hands as he tried to fend off the man. When the MP escaped and tried to run for help, Ashman turned on 39-year-old Mr Pennington, killing him. Mr Pennington was posthumously awarded the George Medal for bravery for saving Nigel Jones's life. Speaking after the verdict was announced, Mr Jones said: "It is so good to get closure on this thing and get back to normal. "It is good that after more than three years my side of the horrible events have been vindicated by a jury and I can try and forget the whole affair. "But of course the loss of my friend Andrew Pennington will be with me forever."